Your “Chart of Account” can be set automatically. OfficeCentral will fill in Header list based on the usual Header list used in company’s accounting. 1. To set Header list automatically, click on “Chart of Accounts (Main)” main which can be found in submodule Chart of Accounts. 2. 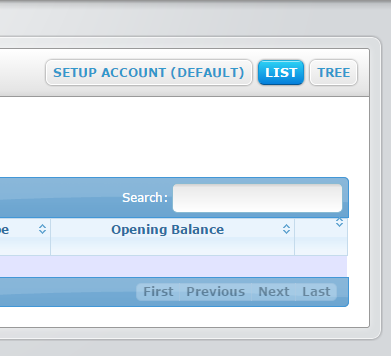 At the Chart of Accounts, click on SETUP ACCOUNT (DEFAULT) as shown above. Subsequently, the list header will be written. 3. The Header serves as a “home” for Detail account. This process will only generate Header, not Detail. Therefore, you need to set each Detail account that will be used. Header does not contain Detail and can be left without any Detail underneath it.